Since commencement we have been focusing on consistent improvement in our quality standards. For this purpose, our experts ensure that the herbs procured are from authentic vendors only. These herbs after procurement are tested on various parameters to ensure their adherence to international standards. Our professionals make use of high grade machines and equipment for processing these products so as to provide our clients with best-in-class products. We understand the fact that clients are the king of the market and in order the survive the fierce competition, they have to be provided with maximum satisfaction. Our professionals ensure that all the products processed in our production unit are safe to use and do not carry any side effects. Moreover, for maximum client satisfaction we accept bulk orders of our clients and ensure their delivery within the stipulated time-frame. We maintain a transparent relationship with our clients and follow a ethical business policies. Owing to all the above reasons, we have been able to muster a huge client-base. Halal India Certification - A Global Business Gateway. This Halal certificate is valid from 14th February 2015 to 13th February 2016. 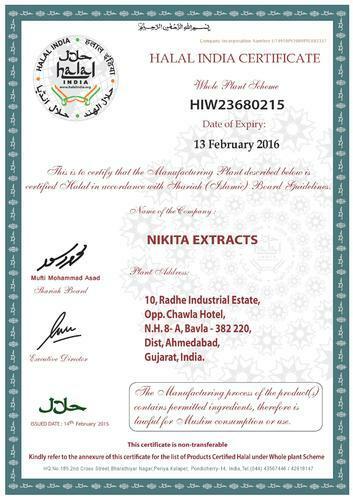 Halal India is very pleased with the quality of your Further Process Manufacturing Plant and Services which abides the Halal Guidelines and hereby, we are issuing you the Halal India Certification for the Whole Plant Scheme. We believe that this will be a perfect occasion to produce a Corporate History to enhance our company's profile by delving and associating ourselves with your esteemed Company to explore new frontiers in quest for Global excellence in the Halal Global Market. For any other Halal clarifications, please feel free to contact us. This document is considered valid only with Halal India seal.